IAM – The Self Esteem Brand. Esteem & Style: Let’s Stop the SELF Body Shaming Already! Esteem and style is like the chicken and the egg argument. Does great style precede great esteem or is it the other way around? As a personal stylist, I’m always hearing others in the industry and even clients talking about “problem areas.” So what exactly IS a problem area? Also referred to as “trouble zones,” problem areas are those areas of one’s body deemed as less than desirable by not only themselves, but by society. This way of thinking is absolutely beyond me. PSA: There is no such thing as a problem area. Women’s bodies have amazing capabilities and should not only be looked at objects of affection or sexualization. I think that in order for outward body shaming to stop, it has to start FIRST within ourselves. Our verbiage and the way we talk about ourselves has to change. If we look at our bodies as having problems and areas that need fixing, we are setting ourselves up for failure. This type of language is the breeding ground for why we struggle to love ourselves as-is in the first place. Now when styling clients, I don’t look to address problem areas and how to hide them. That makes them seem like a deep, dark secret and we should never view our bodies that way. I look to work my clients and find things that they LOVE about their bodies and find ways to celebrate them! If this sounds like something you agree with and you’re looking to elevate your style, email me at iamaquielmiller@gmail.com to book a FREE virtual style discovery consultation! Let’s just face it. Some of us are more punctual than others. We all know someone who is always barreling and brushing past the knees of others who arrived on time to get to the middle seat that is inevitably open because it is the only seat left in the meeting. Maybe YOU are that person. And that is okay. I was too. But it’s time to change! Here are 5 proven ways that’ll have you at the office just in time for your first appointment. Follow these simple steps and you will be getting to work ON time in NO time. You have to get ready for game day the night before! If you are waiting until the morning of to start gathering your things to get out of the door, you’ll fail every. single. time. If you are not making your lunch, ironing your clothes, or gathering important documents for the next day the night before, the morning will surely be a time of grief and tardiness. We’ve all done it. Try to squeeze in that last little ounce of sleep before we take on the day. It is NEVER worth it. If you are that tired in the mornings you probably are either having issues sleeping in the first place or you just need to simply go to bed earlier (which leads me to my next point). I know, I know. You just have to stay up late and watch your favorite hour-long TV show that comes on at 10. Record it and watch it later! You can watch it on your lunch break or earlier while you are making dinner. Just make sure that if you’re online you stay away from spoiler alerts! This was my problem. I always wasted the time I had to get ready by lollygagging until I was in a rush even though I woke up in time. We usually know approximately how long it takes us to get ready. Personally, it takes me exactly 45 minutes, therefore I have to allot time accordingly to each task. If you wake up early immediately start preparing for your day. Yes, you have permission to enjoy the morning BUT do so proactively. Now, one of my friends gave me this idea. She changed the clocks in her house and her car so that she tricks herself into being on time. How smart! So while her brain is thinking that she is running late, she is actually right on schedule to make it to wherever she’s going. I know sometimes things are easier said than done. But I don’t think that logic applies to any of these steps. All it takes is a little preparation to be successful this coming week! If you enjoyed this post please don’t hesitate to follow my blog so you never have to miss a post! I’ve got a feeling that next year is going to be one for the books (in an AMAZING way)! I am so excited for the cool, new things that I will be offering this coming year on my blog. Plan to see more frequent posts on fashion, style, health & fitness, finances, confidence, relationships and so much more! This past year been my least favorite (to say the least!) and I’ll actually be discussing some my 2016 takeaways in the near future. 2017 has already started for me! If you want your next to be greater than your before, well sweetie, you’ve got to be prepared and ready with arms wide open. Fortune favors action. If someone came to you today and asked you how much you needed to start your business, would you know DOWN. TO. THE. CENT? If your favorite industry icon knocked at your door at this very moment, would you already have your stuff together, or would you have to get ready? Fam, we have to be ready for our dreams to collide with us. I know I’ll be ready to collide with mine. Stay tuned and get ready to enjoy the ride. I had a mini meltdown in the Burger King yesterday. I got to thinking about how I feel like my life after college has been such a bust—started working 2 jobs I’m not necessarily crazy about, I have more debt in my life than I’d like to admit, and I still have so many things I want and NEED to do. And while all of this is going on, the little voice inside my head (and heart) is screaming to be heard. “You have an audience, a people to save…They’re waiting on you!” That voice is getting louder and less easy to ignore. All of the pressure is too much sometimes (to say the least). Juggling life and expectations carries a greater weight than I care to bear sometimes. All I truly want is to help others find themselves, make my parents’ sacrifices worth it, and have my independence. So I’m walking through Target’s book section with my boyfriend after the Burger King incident. And I come across, what it seems to be, the answer to a heart prayer. I immediately crack open its pages and breathe a sigh of relief. I’m only shy thirty pages into the God-send, and she’s already pouring out a crazy amount of knowledge about finding and trusting self, coupled with sound business tips and advice. 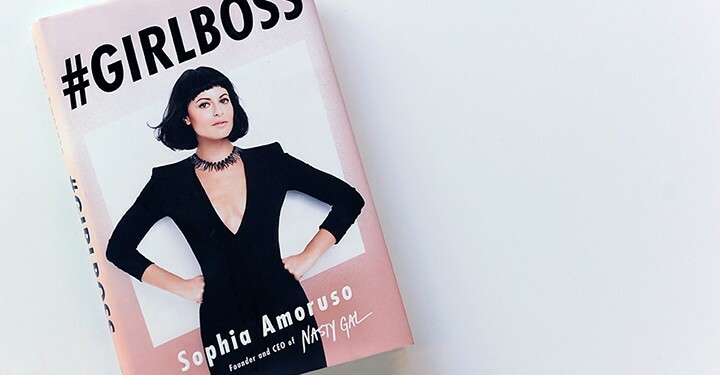 When I find little gems like #GIRLBOSS along the way, I can hear God’s voice saying “Daughter I am still here with you.” I just love it when He gives out those little knowledge nuggets to help us keep going. Moral of the story: I’m still a work in progress. My Body felt Like it Was Going to Snap in Half! Sooo around this time last week I was driving in my car on the way to my mom’s house when all of a sudden a striking pain in my lower back comes up on me out of nowhere! My boyfriend always complains about how hard the seats are in my car, so I chalked it up to that. But this time he insisted that it was something more. The pain persisted to the point that it was hard to get up and down. Now, all three of my siblings are star athletes and lead very active lives. Once I started telling my baby brother about the pain he told me that it was actually stemming more from my hips which was causing pain in my lower back. It was in that very moment I realized how out of shape I am! My body felt like it was about to snap in half! I hadn’t stretched or really done any heaving lifting in 2 months. To be honest, I totally felt like a wimp because my body hadn’t been SO weak in so long. But instead of being angry at myself over how far I’d fallen, I’ve resumed my workout regimen. Now, I’ll be honest I hate working out but I have the nutrition part down to the tee. So much so that I was able to drop 25 pounds and keep it off. Exercise is NOT my strong point but after the lower back incident I see that it is absolutely necessary. My ultimate goal right now is to be able to fit into anything I’d like and look exactly how I want to! But I’ve also realized that will never happen if I don’t do anything about it. I’m going to play to my strengths. I basically have everything I need—nutrition knowledge, a phenomenal support system, and the best athletes on this side of heaven! There are tons of fitness programs and trainers around. You can either try locally or online. Take baby steps! Maybe you can’t commit yourself to working out 5-6 times a week. Start with 2-3. Slowly start adjusting your diet to fit what’s up ahead. It’s much easier to exercise when you’ve been eating a nice salad instead of after a greasy burger. You ever look back at time you’ve ALLOWED yourself to lose and get super angry at yourself? Ever start (re-) jotting down ideas of things you want to do only to realize that you’ve already went through that phase? Ever let the dishes, laundry, or any task you don’t feel like doing pile for days or weeks? Oh yeah! Ever notice patterns in your life where you’ve procrastinated, knew it, and blamed your procrastination on everything but who the blame needs to be on? Well, I can pretty much guess that if you’re reading this post that you feel exactly as I do. Now, this post is not one of pity and condemnation, but actually, the exact opposite. I’ve noticed patterns in my life where I will get so motivated for something and come up with all of these fabulous ideas. I’ll even go as far as bouncing the ideas off of close friends and family members and doing a little research, but then that’s about as far as it gets. I’m tired of that! I’m sure that I’m not alone when I say that I’ve allowed procrastination, laziness, and my emotions get in the way of what I truly want. And that is to be ENTIRELY who I’m created to be. Take responsibility for the time we’ve let get away, missed opportunities we weren’t prepared for, and bad habits that keep us from being focused. Set realistic goals. Jot them down and then TAKE ACTION! This is where I’ve missed it. I get the ideas out of my head and onto paper and then they die there. Don’t let that happen another day! My mom gave me a great idea. Try setting 2-4 goals in 30, 40, 60 day increments or whatever is most realistic for you. Prepare for the road ahead. I know this is a tough one because it is easier said than done but always remember. Failing to plan is planning to fail. I would really love to hear your feedback on this post with ways you overcome your biggest personal challenges that try to keep you from being focused. Yesterday was one of the best days I’ve had in a really long time. I wasn’t consumed with business, employees, weight training, & all these flaws that I think I have. First, I started my day at the bank where a once-stranger became a lifelong friend. I then decided to grab me a healthy lunch & head to the beach as yesterday the weather was too perfect for words. I wasn’t intending on staying long. And I didn’t. It was in the warm light of the sun, the crashing waves, & the oral ambiance of the beach that I finally understood happiness is not a destination, a person, a thing. But it found when you embrace the sweet moments for what they are realize that you’ll never get those moments again. It was like in that moment nothing mattered. Didn’t want to make this long but just know that no matter how much you worry, live in a state of panic, or chase “happiness” life happens the way it is supposed to. Embrace great moments & learn from the not-so-great ones. Your Dreams Shouldn’t be Optional..
Hey all you fab folks out there! I really miss you all 🙂 So this morning I’m at work thinking about all of the things I have coming up: personal deadlines for my blog & business, body benchmarks, getting clothes ready for a fashion show, etc. And as I’m thinking about my forever running to-do list, I try to think of ways that I can be motivated & use my time wisely. Then all of a sudden it hits me! I suddenly realize that most people just like me have goals & things on our to-do list but I noticed I was already making excuses in my mind if I “just so happened” wouldn’t be able to get these things done! Why do we make our dreams and goals so optional? It’s almost as if we make promises to ourselves & don’t mind if we don’t keep them. Put your dreams down on paper. Write the vision! When you’re able to unscramble the things you have to do & you can visually see what you have to do you’re more likely to follow through with them. Be realistic. My little brother put it to me simply: don’t make thanksgiving dinners (enormous goals) for yourself to eat everyday! Make small snacks (bite-sized goals) so that you can actually accomplish something. Take yourself seriously. You wake up in the morning & get there on time everyday because it’s not an option, right? Neither are you dreams/goals! Enjoy the process. This is a BIG one. Being afraid of the journey &I the unknown ahead will keep you frozen in fear. Don’t let it! I think the last tip is the biggest reason why we don’t move forward. We’re afraid of what the process is going to look like. But little do you know ypu probably have everything you need to move forward right under your nose. "He has made all things beautiful in its time." Think about yourself and where you are in life. Do the outfits you choose reflect where you ate? Do your outfits look like you? Stressed when getting dressed? Getting dressed should not be stressful! Having great style is not just for special people. It's for you too! Learn how to put together outfits YOURSELF that you love. Tap link in bio to sign up! DM for details. Ever have those mornings when the “can’t” voice beats you out of bed? Before you can even start your day, you’re already overwhelmed with the stuff you feel like you won’t get done by day’s end. Y’all, I’m learning sometimes you LITERALLY have to verbally speak to that voice and say “Not today!” That nasty lil voice can be loud and fearless. That means you have to be loudER and MORE fearless. I know it’s cliche but you will literally have what you say! Most times we don’t even give external forces time to stop us because we stop our selves SINGLEHANDEDLY with our own mouths! Stop comparing yourself to everyone else’s progress and focus on your own beautiful journey. Remember.. “He has made all things beautiful in its time..” Your time is not coming. It’s already here. Happy Wednesday!